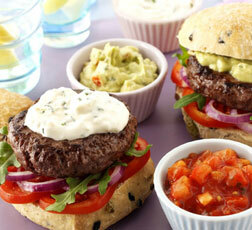 Cook the burgers over hot barbecue coals or under a grill for 8-10mins, turning once until they're are cooked through. Meanwhile spoon the dips into serving bowls. If liked, lightly toast the crusty rolls over the coals.